This step-by-step tutorial teaches you the Kodi CHAPPiE Build FireStick Install process. This install method works for ANY device – not just Firestick. But I felt I should mention that CHAPPiE Build for Kodi 17 Krypton works extremely well. Krypton is also one of the best lightweight Kodi builds. 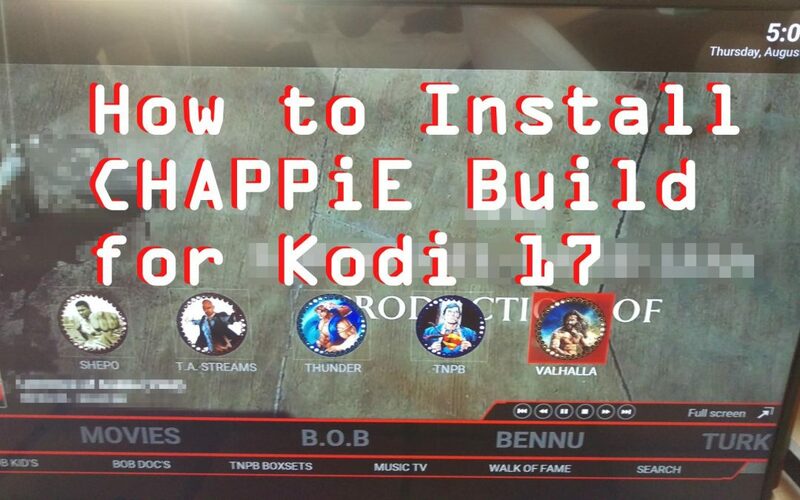 What’s in Kodi CHAPPiE Build? The following sections are present in the “Red” version of CHAPPiE build for Kodi 17 Krypton (install directions below). 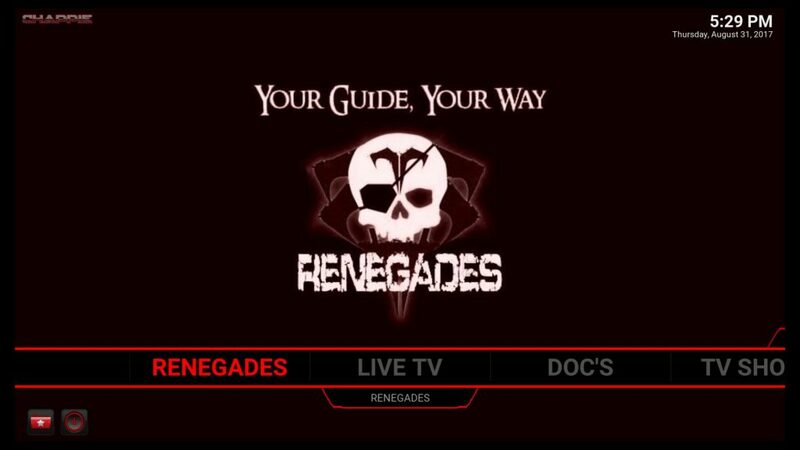 Renegades is a section in CHAPPiE that launchces a TV program-guide style addon which attempts to load live TV sources and display them as a cable box would. I couldn’t get this particular part of Chappie to work. Specifically, it wouldn’t load the TV show names. Maybe they’ll fix it soon.. but the other parts of Chappie worked well for me! So keep reading to check out everything else Chappie build has to offer. Chappie has Live TV addons for streaming IPTV and other current media. Some Kodi IPTV addons Chappie has in store include TV Player, Oblivion, Notfilmon, Tiggers, Cerus, Turks UK Playlist, and Maverick IPTV. 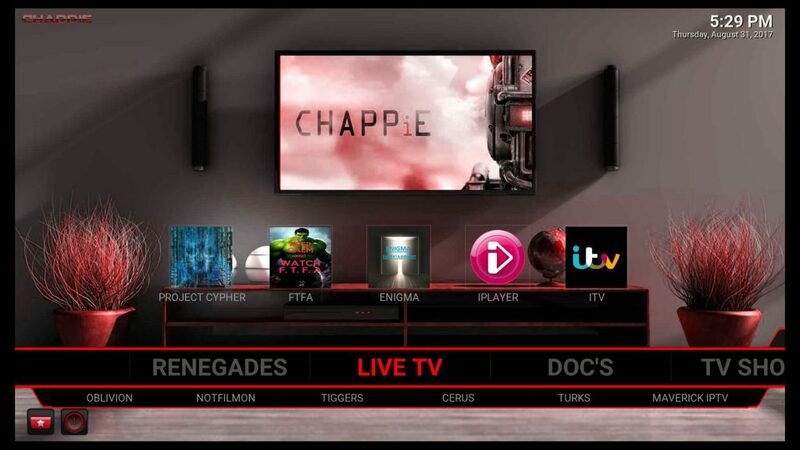 In the “top row” of icons displayed above Chappie’s Live TV section are Project Cypher, FTFA, Enigma, iPlayer, and ITV. Enjoy CHAPPiE’s Movie addons for watching video files. 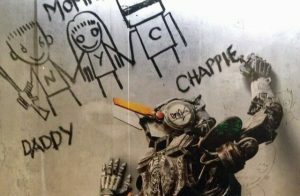 Some movie addons included in Chappie are At The Flix, Real-Movies, Lions Den, Film Emporium, Dandymedia, Gurzil, Kingmovies, Goststreams, Bucky movies, and Poseiden. Chappie has several TV show addons, including Kingmovies, Go Streams, Posiden, 1080p Movies, and Delorean. Documentaries: Chappie has an entire main menu section devoted to Documentaries! 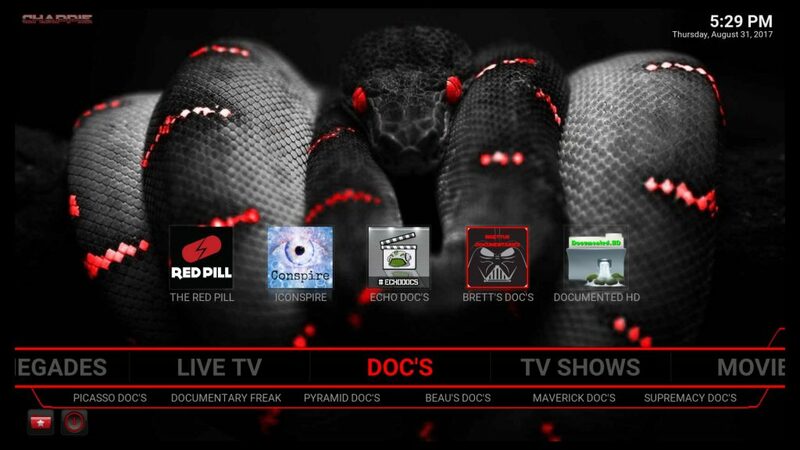 Use Kodi movie addons such as Red Pill, Iconspire, Echo Doc’s, Brett’s Doc’s, Maverick Doc’s, and more. Chappie also Music addons for listening to all kind of music. Note: BEATz is included in CHAPPiE build! The BeatZ Kodi addon is an amazing little Kodi app that lets you search for MP3 files from across the Internet by Artist Name or Song Title. Some other music addons included in CHAPPiE build are Now Music, Now USA, The Jukebox, Hippy’s Music, Music Source, and Top 40 Charts. To see the rest of what Chappie has to offer, scroll down to the bottom of this tutorial. 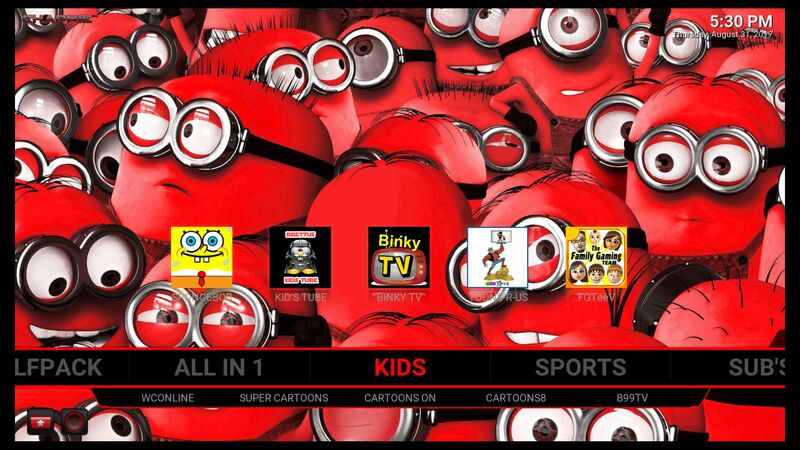 Or just use the direction below to install it and see for yourself what Kodi Chappie build has to offer! For more Kodi builds that run great on Amazon Firestick and Fire TV, keep reading. Watch How to Install Emulators on Firestick, so you can play retro games right on your Firestick (like Super Mario Kart – the real deal). Learn how to Set up a Kodi VPN using my VPN walk-through video on YouTube to protect all the data coming from and going to your PC and other devices. More Kodi 17 Krypton Builds!! If you continue to install Kodi 17 CHAPPiE Build on Firestick, you should also know that No Limits Magic Build, Zero Tolerance Build, and Config Wizard all work great on Amazon FireStick as well. The steps below and my YouTube video in this article show you how to install Kodi 17 CHAPPiE Build Firestick version. Now select the Gear icon in the top left corner of the screen. 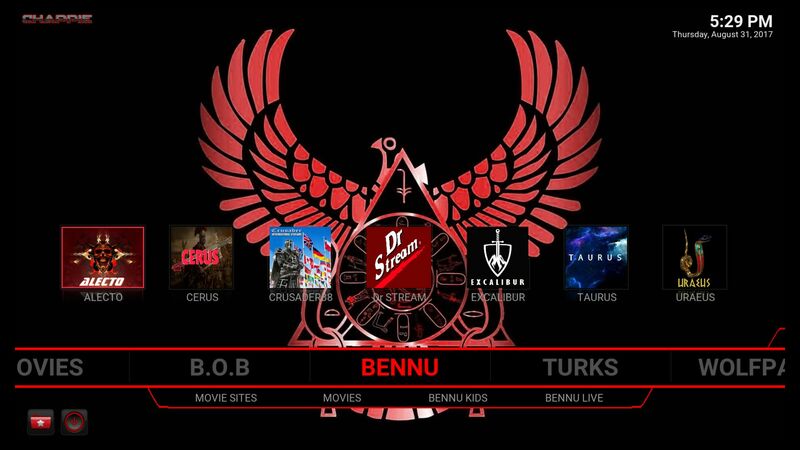 This is known as the System icon in Kodi 17 Krypton. Now select the menu item that says System Settings. Then select “Add-Ons” using the menu in the left-hand side of the screen. Make sure to Turn On the menu item on your screen that says “Unknown Sources” . After you turn on Unknown Sources in Kodi, select “Yes“. Then choose the File Manager menu item. Then select the box that’s labelled “Enter a name for this media source”. So, choose a name such as “kfiretv CHAPPiE” and enter it. Then select OK. Choose OK one more time to finalize the new source you just added to Kodi. 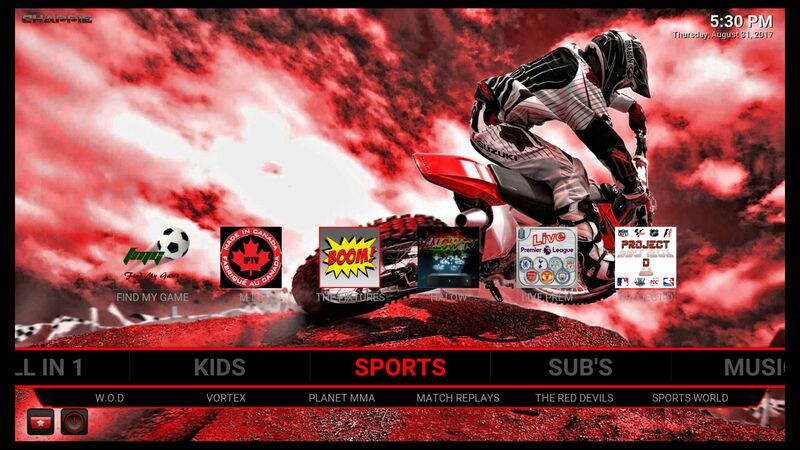 Now return to the Kodi home screen. Then select the Package Installer icon, which lies in the left-top corner of your Kodi homescreen. This icon looks like a picture of a Package. 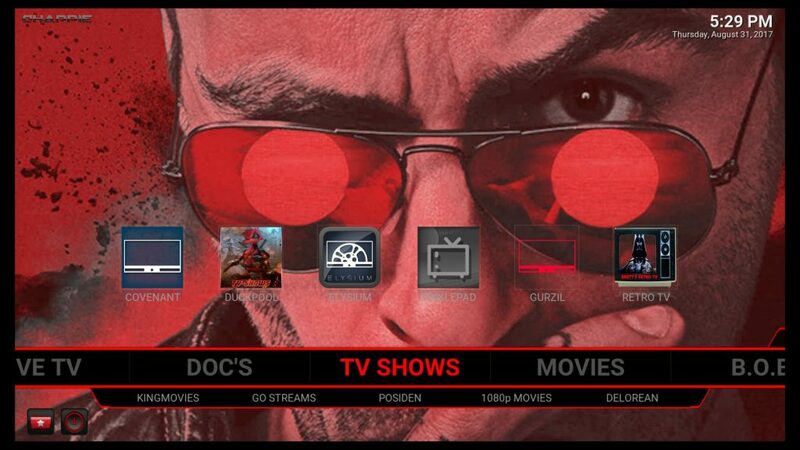 Then select the new Kodi source you added, named “kfiretv CHAPPiE”. Wait for the Ares Wizard to install. Kodi may or may not display a notification, so wait about a minute after selecting the zip file. Then continue to the next step. After Ares Wizard is open, find “CHAPPiE” under “Browse Builds”. Once you select “Browse Builds”, make sure to then select “All Builds”. In the “All Builds” list, you will find “CHAPPiE” build. Select CHAPPiE. Then finally select “CHAPPiE Red Edition” (or similar name). After that, select “Install” to start the Kodi Chappie Build install process. After Chappie Build is done installing, restart Kodi to enjoy the madness. After Chappie Build for Kodi is open, Select “Dismiss” or “Remind Me Later” if a notification message appears on your HDTV / monitor. Now navigate the Chappie main menu using your Firestick remote or keyboard. Expert Tip: We recommend you check out the “BOB” section. 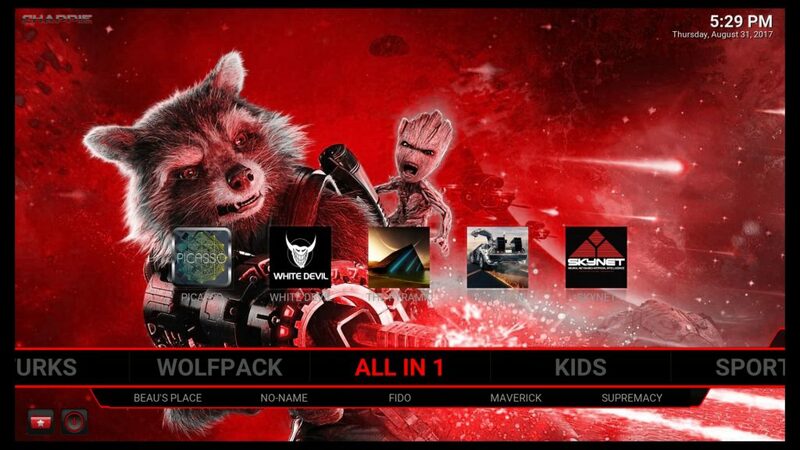 Then select “Valhalla” just above and to the right of “BOB” (with BOB as the “selected” menu in Kodi’s main menu). See Valhalla above and to the right of BOB? Check it out. It’s cool. What Else Does Chappie Build Contain? Chappie Build has a BOB section. The BOB section contains various plugins developed by B.O.B (a Kodi addon maker). 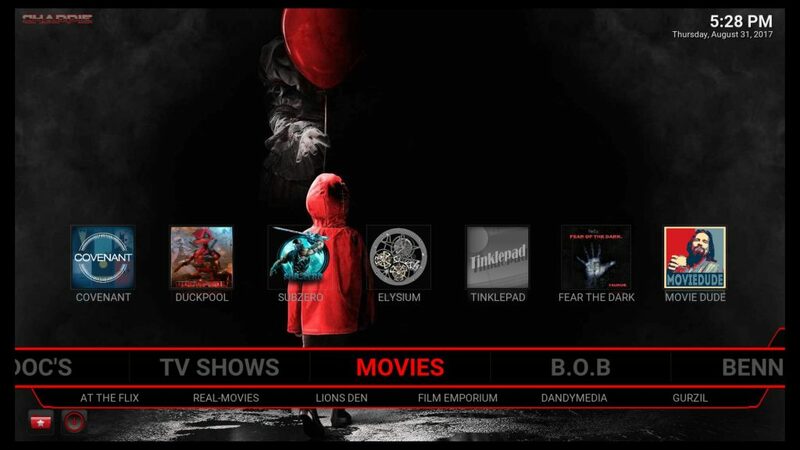 Some of these BOB addons for Kodi include New Releases, Amazing TV, Bob Kid’s, Bob Doc’s, TNPB Boxsets, Music TV, Walk of Fame, and even a “Search” button. BOB also has a row of icons at the top of the screen that say “Caira, Griffin, Shepo, T.A. Streams, Thunder, TNPB, and Valhalla”. Each one of these icons Note: Bob is also known as BOB Unleashed. Pro Tip: Don’t underestimate the “Top Row” of icons above each main menu item in Chappie build. For example, the “Valhalla” button (above the word “B.O.B.” in the Chappie home screen) takes you to an amazing list of media files. Some sub-lists in this main “Valhalla” list include Hot Movies, IMDB Top 1000, Best of 2017, Best of 2016, Best of 2015, Actors, Anthology, Horror, Marvel vs DC, Crime, Danish Collection, Kids & Animation, and “Dog’s Place”. So check out these awesome media lists for great video streaming in Kodi Chappie build. Extra Tip: If you choose the IMDB Top 1000 list, the list will load – but slowly. I selected the IMDB Top 1000 kodi list and about 5 minutes later it was currently at 495 out of 1000. After about 10 minutes, the entire list of 1000 movies loaded up just fine! Instantly I was watching an amazing classic movie. So give Kodi Chappie Build just a few minutes to load up the complete Kodi IMDB Top 1000 List! Then stream to your heart’s content. These are the icons above “Bob”, which I call the “Top Row”. Valhalla is my favorite Top Row icon in Chappie Build so far. But there’s so much in Chappie Build, I haven’t explored it all yet. Here’s the LIVE TV section in Chappie build. It even has a KIDS section. The SPORTS section of Chappie supposedly has Live sports addons, but I haven’t verified that yet. The Kodi Chappie build install process worked well for me. If you have trouble with it, ask us on the KFireTV YouTube channel! Sorry for the late reply. I’m glad you like the build! 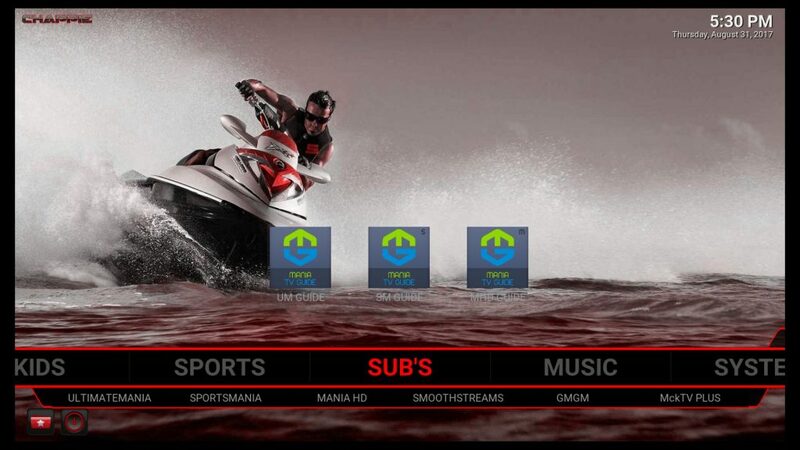 Have you seen this guide on how to add subtitles to Kodi?